WISH LIST!!! 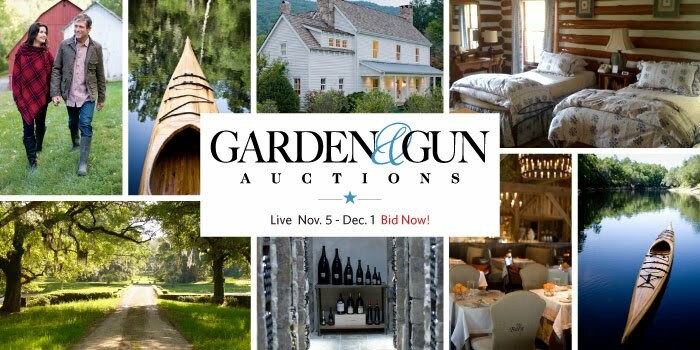 Garden & Gun Auctions! Since our first issue in spring 2007, Garden & Gun has brought the South to life with highly evocative writing, design, and photography. The idea was to make the magazine so rich that readers could taste the mint juleps, smell the jasmine, and feel the shade of the live oaks. Metaphorically, of course. Starting now, Garden & Gun will make some of those experiences literally come to life with the introduction of G&G Auctions. Working with select Southern partners, and with the auction Web site igavel.com, our staff has designed a series of unique adventures that capture the essence of G&G as well as the magic of the South. Throughout the year, we’ll introduce new auction items that cover a broad range of experiences. Some of the upcoming lots include a private dinner party at a Frank Lloyd Wright-designed Southern plantation, a coastal tour (by yacht) of the South’s best golf courses, and an exclusive weekend with chefs, authors, and musicians at Tennessee’s Blackberry Farm. Whether or not you decide to bid, we hope you’ll enjoy reading about these experiences as much as we’ve enjoyed crafting them. Follow the links below to see the first G&G Auction lots on igavel.com.